For broader coverage of this topic, see Vertical position. For other uses, see Elevation (disambiguation). 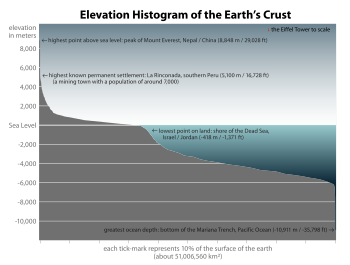 The elevation of a geographic location is its height above or below a fixed reference point, most commonly a reference geoid, a mathematical model of the Earth's sea level as an equipotential gravitational surface (see Geodetic datum § Vertical datum). 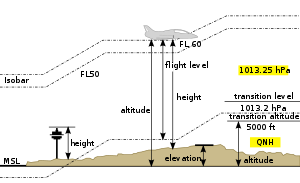 The term elevation is mainly used when referring to points on the Earth's surface, while altitude or geopotential height is used for points above the surface, such as an aircraft in flight or a spacecraft in orbit, and depth is used for points below the surface. 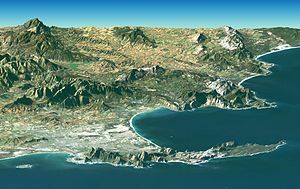 Landsat Image over SRTM Elevation by NASA, showing the Cape Peninsula and Cape of Good Hope, South Africa in the foreground. 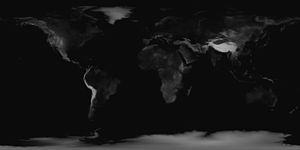 GIS or geographic information system is a computer system that allows for visualizing, manipulating, capturing, and storage of data with associated attributes. GIS offers better understanding of patterns and relationships of the landscape at different scales. Tools inside the GIS allow for manipulation of data for spatial analysis or cartography. 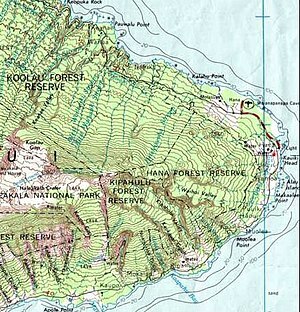 A topographical map is the main type of map used to depict elevation, often through use of contour lines. In a Geographic Information System (GIS), digital elevation models (DEM) are commonly used to represent the surface (topography) of a place, through a raster (grid) dataset of elevations. Digital terrain models are another way to represent terrain in GIS. USGS (United States Geologic Survey) is developing a 3D Elevation Program (3DEP) to keep up with growing needs for high quality topographic data. 3DEP is a collection of enhanced elevation data in the form of high quality LiDAR data over the conterminous United States, Hawaii, and the U.S. territories. There are three bare earth DEM layers in 3DEP which are nationally seamless at the resolution of 1/3, 1, and 2 arcseconds. This map is derived from GTOPO30 data that describes the elevation of Earth's terrain at intervals of 30 arcseconds (approximately 1 km). It uses color and shading instead of contour lines to indicate elevation. ^ Survey, U.S. Geological. "The National Map: Elevation". nationalmap.gov. Retrieved 2017-02-24. Look up elevation in Wiktionary, the free dictionary.